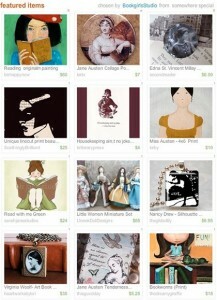 I just snagged my first Treasury on Etsy. What’s a treasury? A collection of handpicked items by Etsy members. Of course you hope that one of these treasuries will be picked for the front page. Anyway, you have to check out my treasury because it’s especially made for bookworms. Hee. And, as it is that time of the year and people are getting presents together, maybe you still need to get your present ready for the Holiday Swap, check out the Well-Dressed Reader. Some seriously cute necklaces. While on the subject of bookish gifts, look at this throw and pillow? Tomorrow it’s supposed to get quite chilly here. Those, a good book and a cup of hot chocolate sound so good. Anyway, I didn’t mean to talk about shopping but just got a bit carried away there. What I did want to tell you is that Dorothy W. has put together a wonderful list of books to choose from for the next Slaves of Golconda reading selection. We won’t be discussing the book until end of January so see, you’ve got plenty of time. Thank you for the peek at your Treasury, Iliana. I just love that throw and pillow. Maybe that should be added to my Christmas wish list . . .
Those are fun shopping ideas. Stay warm! It is -5F in Eagle River right now… That blanket and pillow would just do the trick.Teee hee he. You have a wonderful treasury! I want it all! When you mentioned the throw and pillow, I immediately remembered the Book Buddy and matching comforter. I have a serious wanting for those, and it isn’t the slightest bit cold here in Florida! I just went shopping yesterday for my Secret Santa book swap person. I need to get things wrapped and sent off because mine is overseas! Great fun to look through your treasury! We are having the first “cold” weather here, and the comforter looks like the perfect thing to wrap up in while reading! How lovely. They all look so good. And I can’t believe I missed out on the deadline for the holiday swap. We are on the same wavelength though because I have been thinking all about holiday shopping….. Literary Feline – Isn’t it great? Perfect for when you want to just feel cozy with a good book! The trhow and pillow are marvelous and the necklaces very cute! All of them are seriously tempting. What a wonderful treasury! Thanks for sharing it with us. You are giving me some good ideas for my Secret Santa and also for some gals in my bookclub! Great treasury Illiana…lol I visited it yesterday and commented…I didnt realize that was you 🙂 oh my gosh, a good book and a cup of hot chocolate sound so good. 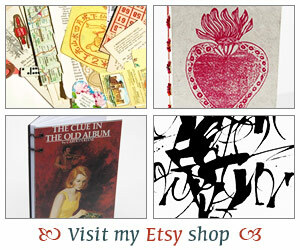 Etsy treasuries are so fun. I’ve discovered so many wonderful artists, and wonderful “I’ve got to have that” things through them. Etsy is a great place for many reasons, but one is that you really can find a lot of affordable things that can fit into a specific theme-based gift especially crafted for a specific person. Such a fun place to spend money! Those are great treasury, Iliana! Kathleen – Oh that’s going to be one lucky secret santa! Carl V. – They are great and I think I’m addicted now. I can’t wait to get another after this one expires. Melody – Yay, glad you liked those! I love the literary ladies! Thanks for linking to the Slaves books — I’m looking forward to seeing which book won. Thanks for a look at the Treasury and the links. have a great weekend.